You know New Zealand is the country of the craziest activities in the world. But they are really expensive as well. So I have something crazy for you which is completely for free. 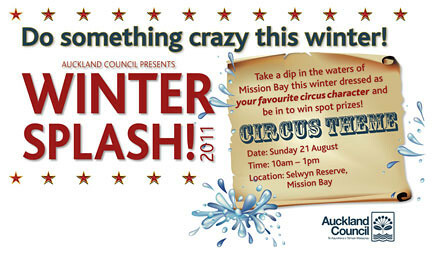 On Sunday, the 21st of August there is the annual Winter Splash in Mission Bay. At this event you can jump into the icy water of the Bay in the middle of winter! And if you’re dressing in costumes you have the chance to get in the draw for some prizes. This year the theme is circus. So get creative and do some really crazy stuff. Thats to crazy for you? And you are more the quite person, just go there and get entertained by all the participants. There will be also some street performers and other entertainment prior to “the big splash”. This entry was posted in INTERNeX, new zealand and tagged auckland, country, crazy, INTERNeX, mission bay, new zealand, refreshment, weekend, winter, winter splash on August 19, 2011 by ixcaroline.